Readers, I know that interfacing can be a tricky subject to understand fully. That's why I'm thrilled to have an interview with Pam Erny today, owner of Fashion Sewing Supply. Pam has interfacings custom milled to her specifications, and her products are widely thought of as the best available to the home sewing market. (I would have to agree; that's why I used her interfacings in my new online tailoring class!) I asked Pam some of my burning interfacing questions below. Read on for her answers, and for a special discount on Fashion Sewing Supply. Why did you decide to start an Interfacing Business? Many of your readers may know that I am a Professionally trained Shirt-maker and Tailor. I decided to start Fashion Sewing Supply, when the Italian source for the interfacing I had been using for my personal sewing and for my clients' custom-made garments was no longer available. So, seven years ago...using my savings and begging for a loan from the bank, I started Fashion Sewing Supply. That sounds easier than it was, because the Interfacings already on the wholesale market did not meet my very picky standards. I could not find true "professional-grade" Interfacings to offer to my customers. That meant I had to design and manufacture my own line, by consulting with textile chemists and by contracting with mills to produce a full range of Interfacing types. Interfacing is the foundation of any garment. It's not a "second-thought" sewing product! To have a great looking garment on the outside, we all need great quality interfacing on the inside. Just like proper seam stitching: just because you cannot see it from the "public side" of your garment, it's still very important. What makes your "Pro-Series" brand of Interfacing different than others? I firmly believe that fabric should be supported by fabric. So all of my interfacings start with the best quality fabrics, not mill leftovers or that stuff that looks like paper. And the fabric we use is milled very wide, we do not slice it up into narrow widths. Why? Wide interfacing saves you money, makes your layout easier, and one yard can often be used for many projects (and it goes a long way, especially since we always cut 38-inch "yards"). We then have those wide fabrics thoroughly steamed at the mill 2 times and then flash-dried with heat so that they do NOT shrink when you use them. Then the interfacings that are going to be made fusible have specially designed "finely crystallized" resins of the highest quality applied to their wrong side. Since all of our interfacings do not shrink, none of that annoying "interfacing pre-soak/ pre-treat routine" is needed. Fashion Sewing Supply Pro-Series interfacing is ready to use right out of the box when it arrives at your door. How do you recommend fusible interfacing be applied? How to make your Own Fusible Stay Tape, with No Cutting! What are some common mistakes sewers make when applying interfacing, and how can they be avoided? The most common mistake I see and hear about, is not preparing/pre-treating the fashion (sewing) fabric you are using by washing, steaming, or dry-cleaning it before the interfacing is applied. Our Pro-Series interfacings from www.FashionSewingSupply.com do not shrink, but your fabric might. So please pre-treat your fabric! If you see bubbles or ripples after washing your finished garment, it is for two possible reasons: 1. The interfacing you used was not of high quality and shrunk, pulling the fabric along with it. 2. Your fabric shrunk, and pulled the interfacing along with it. And one more very important thing...always follow the directions that come with your interfacing. What are the types of interfacing you recommend every sewer have on hand, and why? I am often asked this question, and I recommend that sewers have the following interfacings on hand, and because they are of such fine quality, even if you do not use them for years they will still be as "fresh" as the day they were milled. And remember, because they are so wide, one yard goes a long way. -- Pro-Weft Supreme Light (and Medium) Fusible Interfacing, for most tailoring applications and collars/cuffs on shirts made from medium weight fabrics like flannel and denim. -- Pro-Tricot Deluxe Fusible Interfacing, for all weights of knit fabrics. 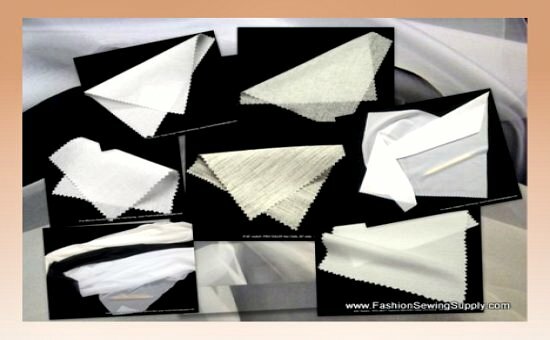 -- Pro-Sheer Elegance Fusible Interfacing, for lightweight woven fabrics like dress/blouse-weight cottons and linens, cotton lawn, "silky" polyesters, and most silks. -- And if you make classic shirts, having Pro-Woven Shirt Crisp Fusible Interfacing on hand will help make your shirts look like the expensive designer shirts you see in upscale boutiques! I LOVE Pam's interfacings and I recommend them to everyone. I've used every brand on the market, but hers are the ones I order over and over again. Thanks for a great interview! I bought some interfacing from Fashion Sewing Supply a couple of weeks ago, and I'm never going back to the 23" wide, $2/yd crap that never fuses to anything. Their interfacing is great. Pam's interfacings are the only ones worth using, really no one out there, NO ONE, comes close to her for quaility, choice and customer service. And her shirt buttons are gorgeous too! I love to read stories about people who are so passionate about what they do! I will check out this site. Thanks! Thanks so much to Gertie for the Interview...and...I need to correct something. Despite being college educated, it does not prevent me from occasionally making awful grammatical errors! Please excuse my use of the word *shrunk* when it clearly should have been *shrank*. Despite proof-reading my responses, I missed it, twice! Shrink, shrank, shrunk - no matter. It is all the best interfacing out there and I love it. I only use Pam's interfacings these days. They are simply the best. And her trick about using weft as fusible stay tape works like magic! Just ordered a few days ago. I was just waiting for organza to be back! I can't wait to make a shirt with her interfacing and try out the little tape measure and clear elastic. I had to refrain myself from buying more! I really appreciate posts like this one. Keep them coming. If someone hasn't used her products before, order her sample pack. You will be sold on them. Love Fashion Sewing Supply interfacing and this interview - thanks Gertie!! I use them with all my sewing students and in my personal sewing. @Pam: do you have a distributor in the EU? I've always avoided sewing items that require interfacing, but after reading your article, I think I may have the nerve to give it a try. And now I'll know the right product to use. The guaranteed payday loans are repaid within a few weeks often by a post paid cheque, which you need to submit at the time of loan approval and it gets electronically credited on a pre-determined date. Those who lived through the great depression remembers what it was like to get along with no payday at all for months on end. It was a grievous time for millions. Fashion Sewing Supply has the best interfacing. I've said that on my blog since 2006 :) http://thestitchery.wordpress.com/2006/11/22/pro-woven-fusible-interfacingsewexciting/ It's wonderful to read am interview with Pam, she is such a talent and takes such care in everything she offers on her site. I love her buttons, too! Thank you for this post, I am excited to have a new source for this necessity. Great topic on the unsung hero of sewing: interfacing. I think it is truly the most overlooked, but vital components of a professionally finished project. Ugghhh, lets all just say no to that generic paper stuff available at mass retailers. I will definitely be checking out Sewing Supply. It's a great topic to address, but i was hoping for a bit more insight on interfacing in general and its uses beyond a sales pitch for their specific products. Thank you making me aware of their existance, it seems a lovely company, but I am a little disappointed. I guess they were a bit too excited about their products :-). I included links to 2 different tutorials about innovative ways to use interfacing. I also addressed how interfacing is made by telling you what goes on at the mills. Additionally, I told you about ways interfacing can "fail, and why. I truly apologize if that was not enough information for you. We offer discounted shipping fees to International customers, and have many customers all over the world. Remember, interfacing is not "fabric", and cannot be crammed into boxes or envelopes..it would arrive unusable. We do our very best to offer fair, reasonable, and *discounted* shipping fees to our international customers. But of course, if you think that $3 per 60" yard is too expensive, I *absolutely* respect your opinion....truly. Our interfacing comes to us from the mills we contract with, on huge 200-500 yard very heavy rolls. By the time we would pay the assorted fees to get that volume/weight of yardage to a dealer in the EU, Australia or Canada, plus the duty fees they would pay...the price to the retail customer would be more than we charge to ship to you directly. This is wonderful! I rarely read about interfacing because it is often overlooked. I love how her interfacing does not shrink as that is the most annoying thing about interfacing. Interfacing that doesn't shrink AND is 60" wide??? I will have to place an order soon!!! Thanks for the interview and the discount! Just placed an order can't wait for my goodies! I'm starting to realize there is a big difference in home sewing that has held some of back. Where are the best resources for products? Look online! Going to a "big box" store and buying some generic fabric (not "Gorgeous") along with cheap supplies (Mika said it right-crap) is going to give you second rate results even if you are the most talented seamstress on the block. It's the quality of ALL the elements that go into creating the perfect garment. My friends always seem surprised when I tell them I buy my almost all of my fabric and supplies online, but they are the best sources for quality products. FSS is a perfect example of why I rarely shop at the chain stores any more. Thanks Gretchen & Pam for all this great information. ps-Glad you're back, thought you maybe got lost in Puyallup!! How do you place an order as an international customer?? which is our order site for International customers. I'm with Mona on this one. It seems like a lovely product, but the blog post felt oddly sales-pitchey. I think Gertie does a great job overall of including ads and sponsored content in a way that doesn't detract from the blog. This is the first time I've felt that I was just being pitched at. I'm so glad to know there's a quality alternative to the crap that's available in the big box stores. If I put time and energy into making something I want to maximize my chances for success by using the best products possible. And let me say I'm totally OK being "pitched" to - I'll be placing and order soon! Thanks!! I apologize for not meeting your and anyone else's expectations. To be cast as a "pitchman" upsets me profoundly on both a personal and professional level. Since the Interfacings I *personally* manufacture from concept to finished products are so different than others on the market...describing them without enthusiasm is impossible, and for that I will not apologize. Thanks for all of this info! I'm always curious about learning more about the proper types of interfacings to use for different projects and my town doesn't have much in terms of local sewing stores, so I am definitely going to be checking this out! Oh, and I don't mind being pitched at for interfacing. It's such an essential and hard to find product. The hair interfacing is awesome. I've been looking for a good source for that for a while. :-) Keep up the good work and thank you. I didn't know that you offer discounted shipping rate for international customers. Thank you ! I would like to address the issue that seems to have popped up on this post. I honestly believe Gertie and Pam were trying to inform Gertie’s readers about the difference between using a quality product and those that are available in chain stores across the country. I believe their intent was to inform and not “plug” a particular product. How would you suggest Pam explain the difference in interfacing without talking about her products? She is very proud to be offering a quality item and was explaining what goes into what she offers. I feel the post was appropriate and am glad Gertie asked her for an interview and Pam’s gracious acceptance of letting Gertie allow her to talk about it on this blog. If you have been a long time reader of Gertie’s blog you know that she wants everyone to succeed at their sewing endeavors and to hopefully learn from her previous mistakes by offering you pertinent information that will prevent “YOU,” her reader, from doing the same. I for one can tell you from personal experience that I have had my fusible interfacing perform as Pam explained with either the fabric or interfacing puckering due to shrinkage or poor adhesion resulting from an inferior product. Very frustrating when you put the time, effort and money into a garment and not have it come out as one would hope! I believe they both were trying to inform the readers about these pitfalls and if offering a resource happens during this interview then KUDO’s to them both for there is nothing more frustrating than seeing the lack of suppliers locally dwindle in regards to quality products. I applaud Gertie for stepping out there and getting this information out to us so that we can make a more informed choice on where to spend those hard earned dollars! My only disappointment with this post...I didn't read it in time to take advantage of the discount being offered but I will not let that stop me from venturing on over to Pam's site and perusing her products considering I have only one resource for sewing materials locally and that is sadly...a chain store. To Gertie and Pam…it is unfortunate, you can’t please everyone. Please don’t let that stop you from doing more interviews and discussions on this and other subjects pertinent to garment construction for there are readers out there that see beyond this issue and truly appreciate your efforts!!! Thanks for sharing this great post!I love it!It really helps me! Maybe I'm blind and didn't see it, I'm not sure, but I'm just wondering what the width your products are, Pam? It all says that it's a wide width, but what's the measurement? I'm sure I'm posting this question in the wrong place, but here goes. I'm making a "nursing cover" from cotton quilting fabric. It has an adjustable self fabric neck strap attached with D rings. I'm at a loss as to what interfacing I should use to keep the strap flat but soft. My Googling has been unhelpful so I've come to the construction oracle to ask for suggestions.